View of the Old Chapter House in Hereford Cathedral. 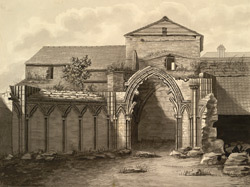 A Chapter house is where the Dean and Chapter (or Canon) would meet to discuss the running of the Cathedral. Chapter Houses are built on the outside of the cloisters and consist of a single room, usually with eight sides although Hereford’s Chapter house has ten sides. The roof would have been supported by a single central column. During the 16th century English Civil War the Royalists stripped the lead from the roof of the Chapter House in Hereford Cathedral. It had one of the earliest examples of a fan vaulted ceiling however it was demolished in 1769.